It was January 2012 when we last visited a Sea Fox in the form of the 199CC. Then, word of an expanded model range arriving in the future sounded promising. Suffice to say, we're now not disappointed. One of two new models we looked at recently was the powerful 256 Voyager Walk Around. Although it was on a trailer at the launch ramp on the Gold Coast, this boat has a beam of 2.8m which puts it in a different light when it comes to legalities on the road. In Queensland, it will require a wide-load sign during daylight hours and a flashing light on the tow vehicle during the hours of darkness. That’s no big hassle especially when you consider what this amount of beam in a trailerboat offers. This legal aspect will require investigation if you are in another state; too bad State Governments can’t get their act together! At least, they're working on it. The 256 WA we reviewed had a price tag of $140,841 which includes the trailer. The Silver Shark-coloured hull is optional as are the full clears from the hard top to the coamings. The trim tab indicator switch is an extra. Other fitted options include overboard waste discharge for toilet, and the upgrade to twin 25in 150hp EFI Mercs with stainless-steel props. The above driveaway price ex-Gold Coast includes registrations as well as safety gear for eight people with flares and EPIRB. The Voyager features a large cabin in which the V-berths may be converted to a double bed with an infill. For dining, a table top stowed under one of the berths is brought into play and three people could comfortably for meals in the cabin. The surround pockets are large and the upholstery extends from there down to the berths. In the aft of the cabin, in the starboard corner against the bulkhead, the cushion is removed and a hatch hinges back to reveal the head which is a macerator type with a 102-litre holding tank. In the opposite corner, a neat galley unit is installed with a timber-finished cabinet above. The sink has pressurised plumbing and a butane stove is stored here, although it is for cockpit use only due to fire safety measures in confined spaces. A bi-fold door secures the cabin when crew are absent or when privacy is required. The amount of stowage available behind hatches in the cockpit is impressive. 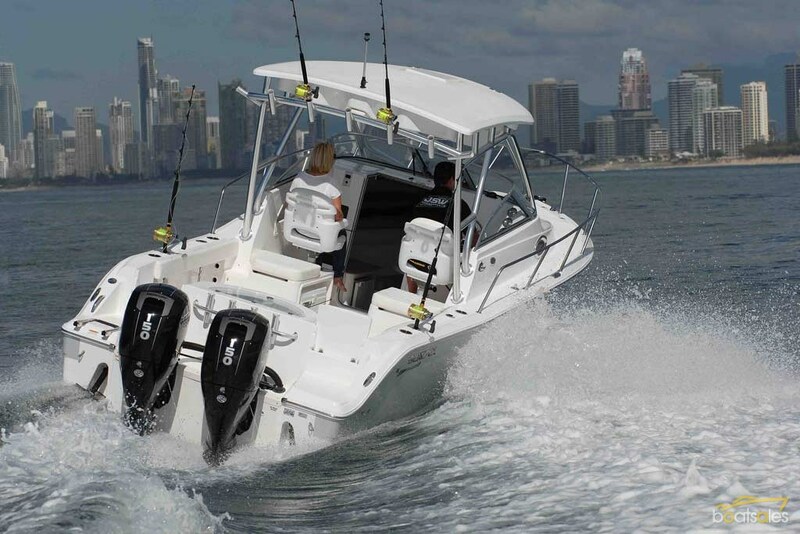 And it is not just that there is a lot of it; the practicality of its design comes into play making for a very well-fitted offshore fishing machine. Between the seat bases in the deck, there is a large box. It has a raised lip with rubber seal to prevent water ingress. 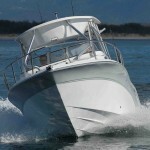 The passenger seat has an alcove open to the companionway in which a removable ice box is secured with a bungee cord. Being removable, it's ideal for baits as it's easy to clean off the boat, or it's handy for taking a picnic lunch to shore. The helm seat box has a removable cushion, under which is a hatch leading into a massive (we guess perhaps 200 litre) ice box. 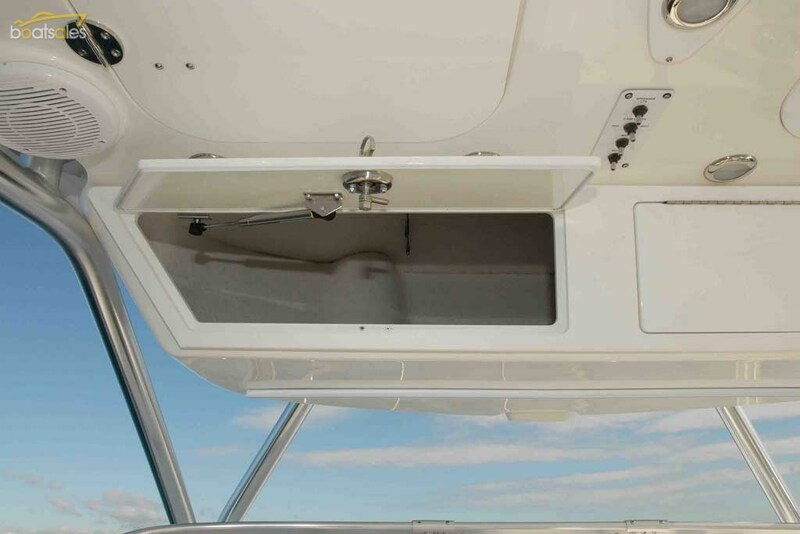 In the side, and accessible from the companionway, is a fold-out hatch revealing a shallow tackle cupboard with hangers for lures and traces and racks for knives and other bait-rigging tools. Two large kill tanks are situated in each side of the deck, while rebates in the cockpit liner have tubes at one end in which rod tips are protected while the remainder of the rods, tag and gaff poles are secured in the racks. The live-bait tank is massive and features rounded corners and a sky-blue finish -- all of which are supposed to lessen the stress and aid the longevity of its occupants. The front of the bulkhead has a removable backrest for those sitting on the bench seat, which may also be removed from the equation. 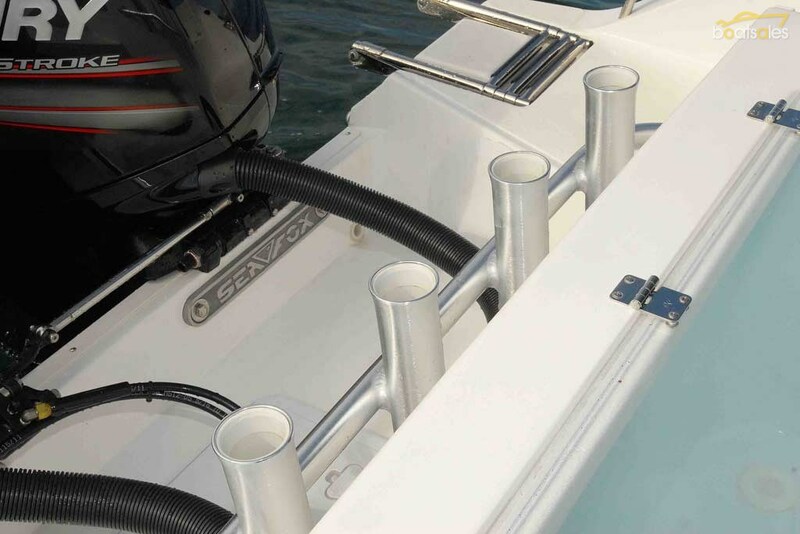 Sea Fox describes their walk-through transom as a "Euro-transom" and it has two short gates that fold down to allow passage through to the boarding platform. When the gates are raised they serve as the backrests for those seated in each aft corner. On the stern, a pair of 150 four-stroke Mercury motors provide the horses, while a boarding ladder is rebated in the platform portside. Sitting in the helm chair, one is presented with a huge flat panel in which the biggest of flush-mounted electronics could be installed. There was no such thing fitted in the review boat, which is more the pity as some fuel consumption figures would have been handy. As fitted, instrumentation for the Mercurys was analogue rather than digital, which we thought was a bit old fashioned considering how hi-tech boating has become these days. 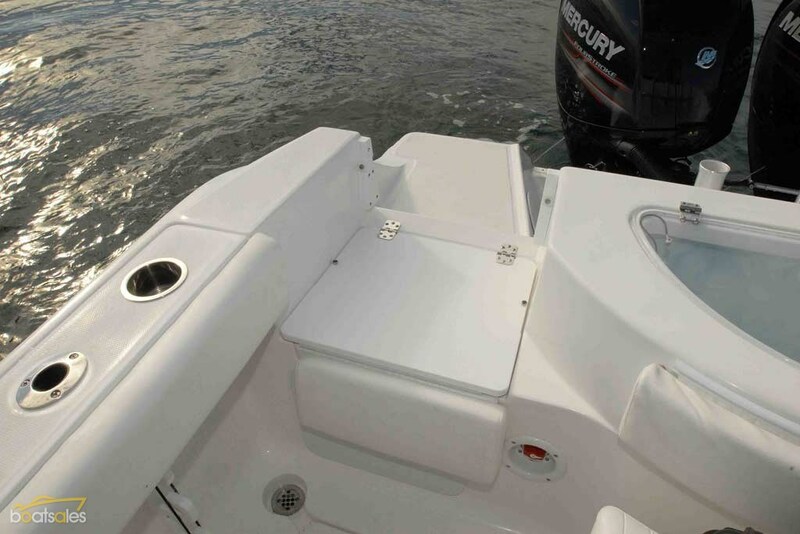 The twin binnacle throttles are fully recessed into the liner and, when in the skipper’s chair, a fold down foot rest is available to support the legs. This was not available for the passenger due to the bi-fold door, and those seated on the port side had only one small grab rail for the left hand. We'd like to see a larger version mounted on top of the dashboard for passenger security. The hardtop on the Voyager is another work of designer art. It has two cabinets in a lower forward section, which are very large and an ideal place to put charts or valuables. 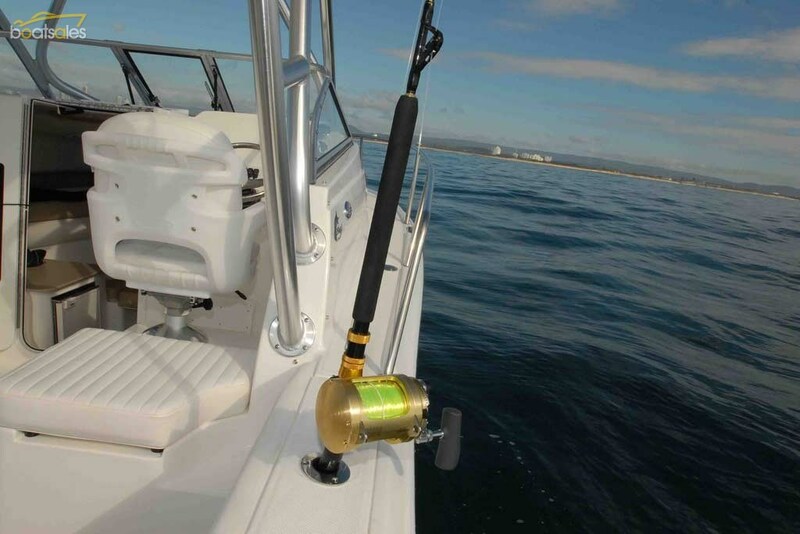 Aft of that, two long hatches drop down to reveal a rigged-rod stowage system where two outfits of up to around 30lb may be stowed and secured with bungee cords. A dozen recessed lights will illuminate the deck nicely with a couple of them being red to reduce glare for night-time navigation. A unique Climate Cool system consisting of misting nozzles is plumbed to a pressure pump and when activated spray and fine mist of freshwater rain down into the cockpit to cool the heels of hot fishos. Now we can say we’ve seen everything! A brace of rods may also be installed across the back of the hardtop with another four secured in the rack behind the transom and two each side in the cockpit coamings. The steering is hydraulic using a single hydraulic ram on the starboard engine with a manual drag link to the portside, and the helm wheel is attached to a multi-positioned hub. 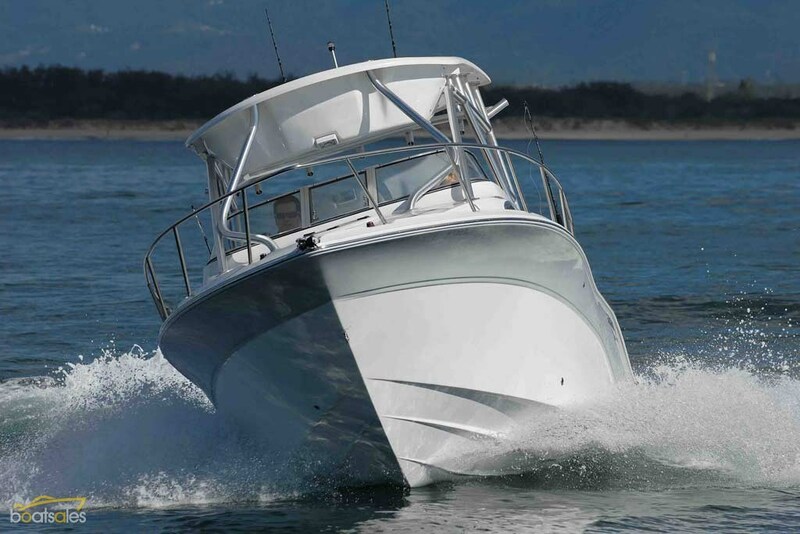 Around 2007, Sea Fox moved away from totally foam-filled hulls to a more conventional hull system where fibreglass stringers were brought into play. The hull is hand laid with seven layers of traditional woven rovings and then the stringer system is bedded down and foam filled. The tops of these stringers are around 200mm wide and it is to these that the topside liner is fixed. There is also foam installed on the inside of the hull forming a core and the deck and modules, such as seat boxes, are foam cored as well. The ratio of foam is 60 per cent topside and 40 per cent below deck, which aids in the muffling of ambient noise from water slap and should give upright buoyancy should something dramatic happen at sea. Hatches and doors are injection moulded resulting in a refined finish; something that is evident everywhere you look on this Sea Fox. - Give us some rough weather! It’s when we're on boats such as the 256 Voyager that we yearn for some lousy weather to define its limits. Murphy’s Law was with us on the day of this test and all we had was a very gently metre of swell, which threw a spanner or less in the works. Stability was excellent dead in the water as well running down the sides of the swell that was building as we approached the Seaway. This showed what such a beamy hull is capable of -- the Carolina-style forequarters look the part and no doubt will work well when it comes to deflecting spray. The 20-degree deadrise combined with the weight of this boat put paid to any pounding that might have arisen when we crossed boat chop offshore. At 2500rpm, the speedometer showed 13 knots while a comfortable cruise of 3000rpm gave 21 knots. At wide-open throttle, 46 knots was realised at 5900rpm. In this day and age, and with a boat of this calibre, it was surprising that we were dealing with analogue instrumentation. This boat has been designed for some serious offshore work and the serious offshore operator will be looking for more defined fuel monitoring than what an analogue instrument can offer. 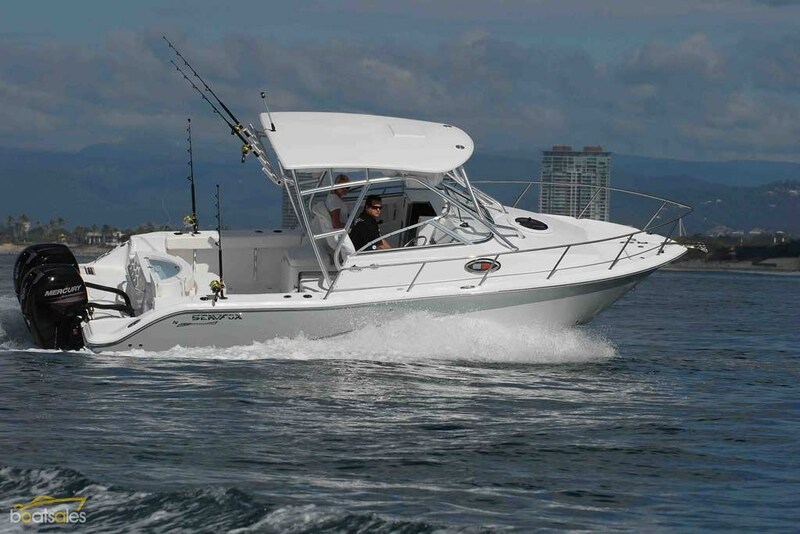 That aside, this, the biggest of the walk-around Sea Fox models is a lot of boat and offers up the quality one would expect for the price tag -- and then some.